I’m so psyched to see this movie TONIGHT at a super-secret early screening I found out about through my brother (the ultimate Trekkie) for which I booked tickets via an APP 3 months ago. I can’t wait to see Chris Pine in a reprise of my favorite role of his, and of course, the lovely Zoe Saldana. At the LA premiere, she looked luminous, thanks to makeup artistVera Steimberg, who created a “chic, French-inspired” look for the “Star Trek Into Darkness” movie premiere. Here’s how Steimberg got the look. · Steimberg applied Laura Mercier Crème Smooth Lip Colour in Hollywood ($26) to Saldana’s lips. “As soon as I saw the dress, I knew we had to go with a red lip,” she stated. · First, Steimberg mixed Laura Mercier Metallic Crème Eye Colour in Gold and Burnished Copper ($23 each) and applied the combination to Saldana’s eyelids and along the bottom of the star’s lash lines. · She then lined the inside rims of the eyes using Laura Mercier Eye Pencil in Special Brown ($20). · Next, she applied Laura Mercier Illuminating Eye Colour in Earth Glow ($24) under Saldana’s eyes, close to her lashes. · For added definition, Steimberg applied a combination of Laura Mercier Matte Eye Colour in Coffee Ground and Truffle ($23 each) to the outer corners of Saldana’s eyes. 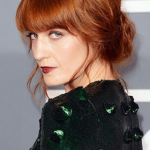 · She added the final touch of glamour by applying multiple coats of Laura Mercier Faux Lash Mascara in Black ($24) to the actress’ top and bottom lashes. · Steimberg covered minor imperfections using Laura Mercier Secret Camouflage in SC-6 ($30). · Next, she lightly dusted Laura Mercier Mineral Illuminating Powder in Candlelight ($32) over the star’s face to create a natural glow. · Lastly, Steimberg applied Laura Mercier Crème Cheek Colour in Blaze ($24) to the apples of Saldana’s cheeks to create a natural flush of color. What do you think of Zoe Saldana’s “Into the Darkness” makeup? Chic or what? @Liz, I’m seeing it tonight! Did you enjoy the movie? My husband is trying to get me to go see it.